TTN: Mid-November 2014 was huge for Australia being promoted as a trade capital – the G20 took place in Brisbane, and more than the average number of world leaders stayed on to tour the country otherwise. The free trade agreement between Australia and China, and whilst the government aren’t promising anything, there is talk of a similar deal happening with India by the end of 2015. 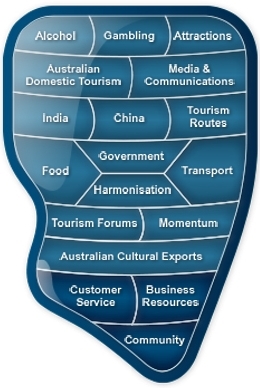 As with China, Australia’s under-capitalised trade strengths with India lie in the services industries, including hospitality and tourism. Indian Prime Minister Narendra Modi has called on Australian businesses to boost their investments in India and expand trade with the Asian giant. Mr Modi turned his attention from diplomacy to business when he arrived in Melbourne on Tuesday for the last leg of his historic visit to Australia. 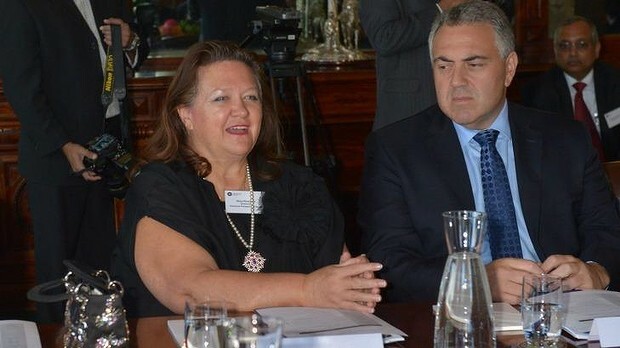 He met some of Australia’s richest people at a high-powered business forum attended by mining magnate Gina Rinehart, Visy Industries chairman Anthony Pratt and logistics entrepreneur Lindsay Fox. In a later speech to about 450 business and community leaders, including cricketers Glen McGrath and Steve Waugh, Mr Modi said that India and Australia were both “strong and resilient economies”. But Mr Modi pointed out that trade between the two countries was still largely confined to a “small basket” of goods, largely primary commodities. “We need to impart more dynamism and bilateral trade and investments,” he said. Mr Modi said he expected the “large and growing” Indian community in Australia would help build links between the two countries. He also drew attention to how several Indian companies are making significant investments in the Australian mining sector. The chief executives’ forum, hosted by Victorian Governor Alex Chernov, involved about 30 business leaders with significant operations in India. Dipen Rughani, president of the Australia India Business Council, said the round table allowed Mr Modi to outline how Australian businesses could work more effectively with the Indian government. There is concern that growth in trade between the two countries has stalled recently. Also, the level of Australian investment in India is relatively small compared with value of the trade relationship. While India is a major Australian export market, trade is dominated by a relatively small number of commodities and services, especially coal, gold and education. Mr Modi is the first Indian prime minister to visit Australia in 28 years and the business community hopes the trip will help push the economic relationship between the two countries to new level. The chief executives’ forum was followed by a reception attended by about 450 business and community leaders. Mr Modi capped off his visit to Australia with a reception at the MCG. India’s prime minister Narendra Modi has praised the progress of his country and spoken of the common values it shares with Australia during an address in Sydney. 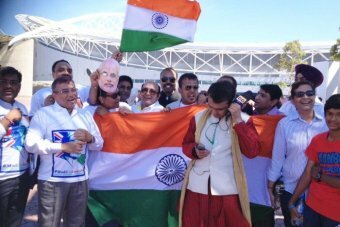 More than 15,000 enthusiastic members of the Indian diaspora gathered to hear Mr Modi speak at Olympic Park. 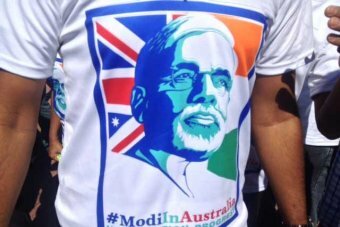 They were dressed in brightly coloured clothing and silk dresses, waved Indian flags and had their picture taken next to cardboard cut-outs of Mr Modi. Some travelled from interstate in specially chartered trains such as the “Modi Express”. Mr Modi paid tribute to the strength of democracy in India and said the country would once again lead the world, as a young and energetic country with “2,500 million arms”. “If there was no height of democracy, do you think I would have been here?” he said. Mr Modi also acknowledged the poverty of his country and the difficulty of providing jobs when there were still many without basic infrastructure. “After so many years of independence, not getting clean drinking water or electricity not available, not only that, even toilets are not there,” he said. “Many people held dreams of doing many great jobs. They may have their dreams. Mr Modi told the enthusiastic audience he wanted to build toilets and had started a project to do so in October. On a lighter note, Mr Modi remarked that neither Australia nor India could live without cricket. “Cricket has joined us but before that we had the cultural history,” he said. 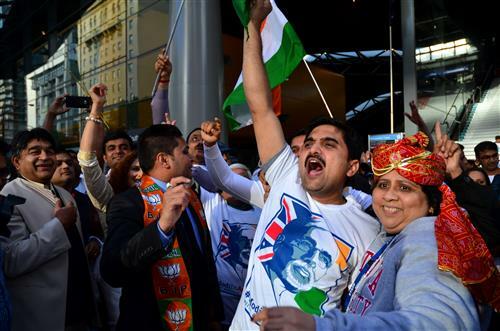 “Australia and India shared common values, democracy, that is there in both the countries. Mr Modi also said he wanted to increase tourism to India and told the audience that Australians would be able to get a visa on arrival in the country. The Indian leader – who was elected in May – went on to say he had demanded that bank accounts be opened for everyone in India, even if they had zero cash in their account. “During (the) last 10 weeks, 71 million bank accounts have already opened. The same government, the same leaders, the same office, the same habit, the same people,” he said. Mr Modi emphasised the need to focus on India’s youth by creating employment and focusing on skill development. “If we want to achieve new heights of development, my dear young friends, India has decided to concentrate on the young people,” he said. “On the confidence of their talent, on the confidence of their capacity, they would become competent to help the whole world. “I wish that the whole world should come to India. The manufacturing sectors, they should come in… because… I wish that the youth of India should get employment. Mr Modi is especially popular amongst his Hindu constituency. While most are celebrating his visit, the Sikh Federation held a protest outside the Olympic indoor stadium. They point to the thousands of Muslims who died in religious violence when Mr Modi was governor of the Indian state of Gujharat. The federation said that minority groups face persecution in a Hindu-dominated India. Police kept both groups well apart. Earlier, a small group of protesters in Sydney called on Mr Modi to end conflict in the disputed territory of Kashmir.